If you're an avid beauty Instagrammer like myself, then no doubt you will have seen Eldora False Lashes being used by a pretty impressive amount of makeup artists from all over the world. 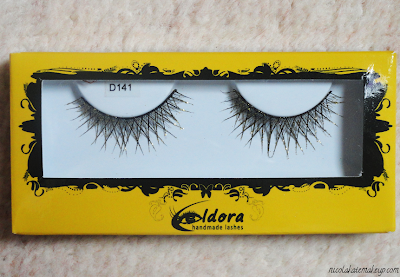 I own four sets of Eldora Lashes (D141, S302, H105 and H125), so I thought I'd take the time to write a little bit about each pair for you, and talk about the brand in general. So, if you're a lash-lover, then keep on reading! 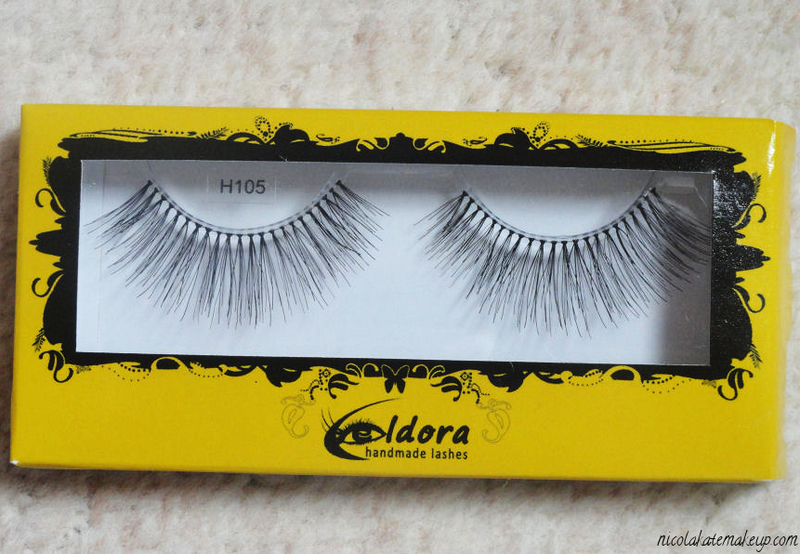 Eldora False Lashes are a Manchester-based company who specialize in creating high quality affordable false lashes. 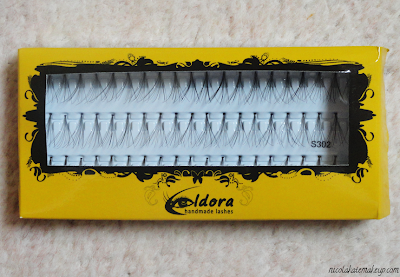 Eldora offer an absolutely huge variety of different styles and eyelash sets for pretty much any kind of occasion that you can think of, including: Real Hair, Dark Synthesis, Coloured, Diamante, Individuals, Maxi, Fabric and Feather. Eldora also stock beauty tools and applicators such as glue, tweezers and eyelash curlers - all at equally great prices. Eldora stock some of the most funkiest, outrageous eyelashes that I've ever come across and the possibilities with these lashes are endless. Their customer service is fantastic and I personally found the Eldora team super polite and friendly - it was a pleasure dealing with them! The Eldora S302's are the longest individual lashes that are available to purchase from the Eldora online store. Personally, I have always preferred strip lashes to individuals as - of course - individuals can take a lot more time to apply and I have always found them quite tedious. So, if you're not used to applying individual lashes you may find these a little fiddly. I've found that these lashes work best on myself when just a few are placed on the outer corner of the eye for a more flared-out feline effect. These lashes might be a little too long to apply all along the lash line for everyday wear, but would easily look great if you're aiming for super-dramatic, ulta-long fluttery lashes. In the past, I've trimmed down a few of these lashes and placed them along the centre of lash line and inner corner, building up graduated length for a lovely flared natural look. Much like the S302's, the H105 lashes are super lengthening. I adore how lightweight these lashes are and the slim lash band makes these a very comfortable pair of eyelashes to wear. 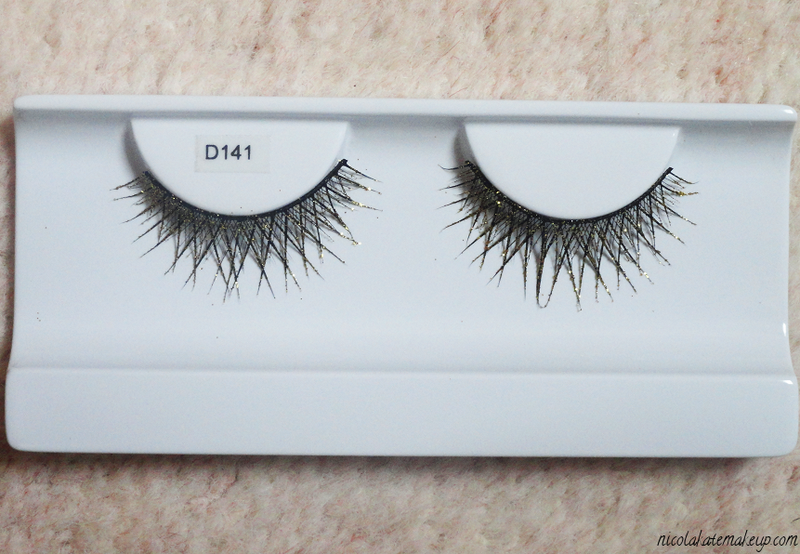 What is most noticeable about these real hair lashes is how soft in texture they are. They appear much more lengthier when actually worn than what they appear to be in the box (you can see these lashes in action here) but nonetheless are still a delicate, flirty and fluffy looking lash. Lashes can always be trimmed down a little if you find that your lashes are a too long for your liking, but I think these ones are charming just as they are. 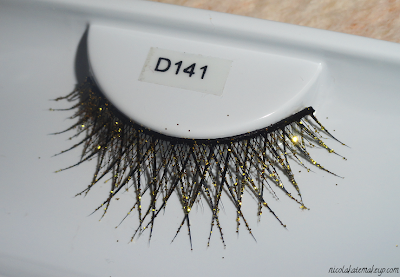 The Edlora D141 lashes are criss-cross style lashes finished off with a decorative golden glitter. I was really excited to receive these as they look so pretty in the box and in online photographs. I already had multiple looks in my mind that I planned to create with them. However, when it came to actually using them I found that I struggled a little when it came to applying them. As these are coated in glitter, the lashes themselves and the thick lash band feel very stiff and due to this reason I had problems with the inner corners lifting every time I tried to apply them, even after flexing the lash band. Another thing that I noticed about them is that due to their general stiffness, the lashes fall more straight rather than curling up, and I imagine it would be tough to curl them with a lash curler because of the glitter. With a little bit more perseverance, I don't plan on giving up on getting these lashes to work, as they truly are gorgeous and would be perfect for the upcoming Christmas season. 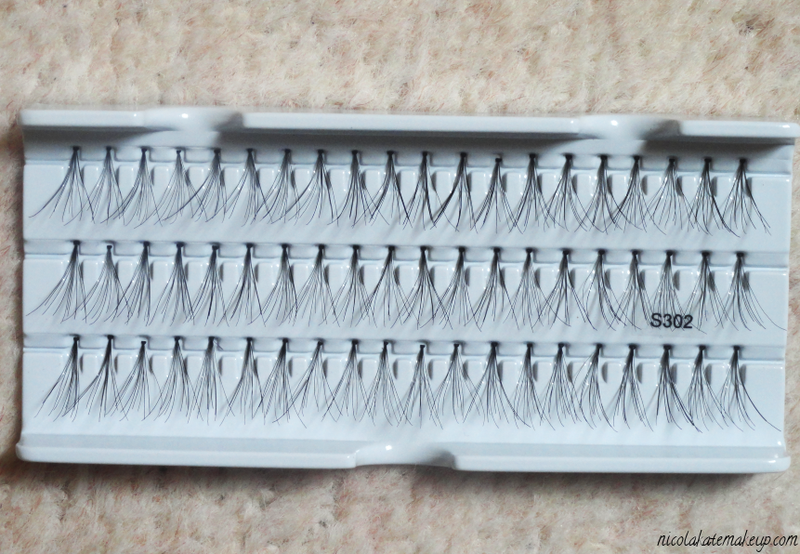 Saving the best 'till last - my favourite lashes out of the whole lot! 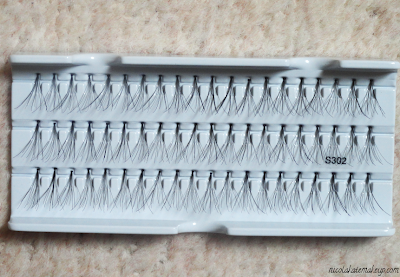 Actually, probably one of my favourite pairs of falsies, period. 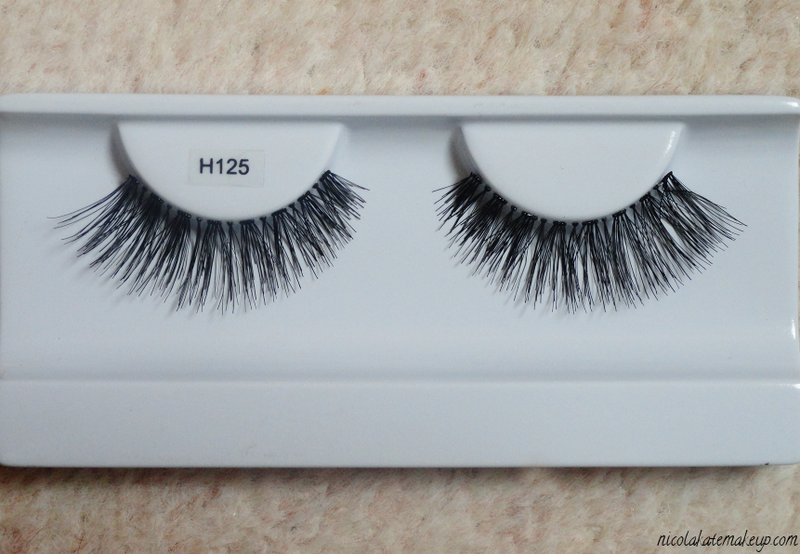 These flared out real hair H125 lashes are perfect when teamed up with a glamorous evening look but aren't so dramatic that they couldn't be pulled off during the daytime, either. 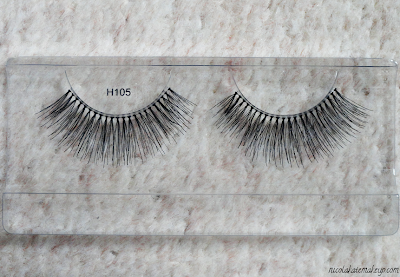 Like the H105's, these lashes are super soft and maintain a very natural appearance even whilst being much fuller and flared. For a thicker lash style, I found these extremely comfortable and lightweight to wear. You can see looks that I've created using these lashes here and here. So, have any of you ever tried out Eldora lashes before? If so, what do you think? Overall, apart from the few negatives I've spoken about, I generally love them and they are most definitely great value for money!